PB+J pie | eating with S.O.L.E. Our newest intern got a gold star cookie request for doing an ungodly task which saved me (and my flake-y constitution) from a barf-fest. His request was for peanut butter cookies, he also has a keen interest in learning how to preserve food. 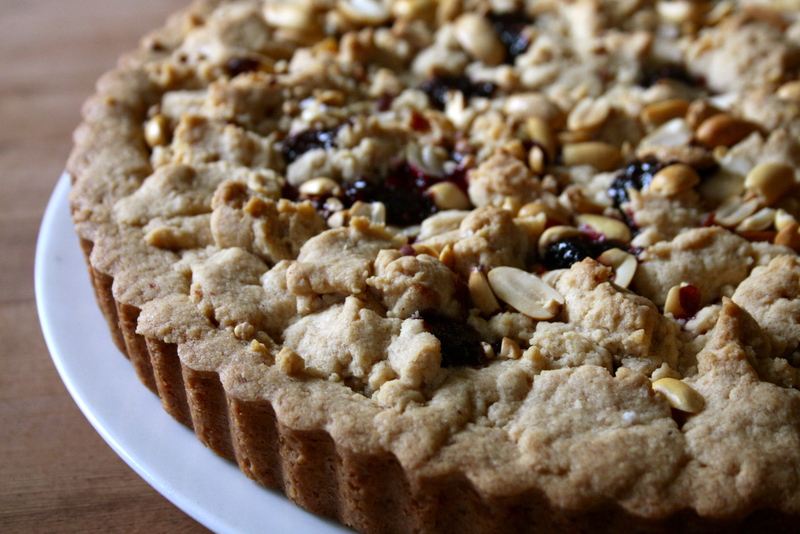 So I combined today’s jam making lesson with peanut butter cookie dough to make this really lovely peanut butter and freshly made jam tart with a sprinkle of sea salt and toasted peanuts. Dave and I made two batches of jam this morning; the first was a double batch of saskatoon berrie jam, In the attempt to free up freezer space for our little piggies arrival, tomorrow. 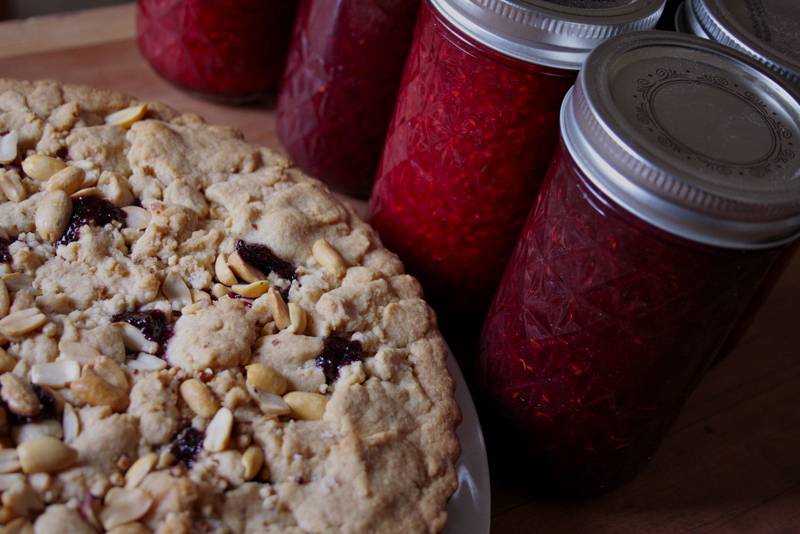 We used up the last of June’s frozen saskatoon harvest , and then we did a triple batch of raspberry jam, made with a trade-sie bag of berries from my best back road girlfriend. I think we got all of 4 raspberries from our new canes last year.. looking forward to a better yield this time around. I found inspiration from this recipe in a food network magazine of all places… a bathroom reader hoarded from the free store, the recipe fit the bill, and I tweaked it to put my own SOLE spin on it. Everyone enjoyed the results… after tasting and making this recipe I have adapted this so you get more goozey and ample jam filling, which was the only thing lacking from my first attempt. press 2/3 of the dough mixture, taking card to build up the edges nice and thick. Then crumble little blobs of the rest of the dough on top of the jam, leaving spaces for jam to pop out. Be careful to keep the jam from the edges so as not to boil over and burn some of the filling. bake for 45-55 minutes or until set and golden brown. yumm, enjoy warm al-la mode, or as a easy to travel PB+J wedge.